“Walk With Joe” is an annual 5K walk honoring Patrick “Joe” Driscoll, Christopher Gray and Tom McCann, and other local area residents who lost their lives on September 11th, 2001. This is the 13th year this memorial walk is being held. On September 6, 10AM, at Monmouth Battlefield State Park, join with the community to celebrate the lives of so many lost. All of the proceeds from the walk, including monies raised from participants and sponsors are donated to numerous charities. For registration and more information, please visit the Walk with Joe website. VETSTOCK, a free outdoor music festival benefit for wounded veterans, will take place on Saturday August 2nd from 12PM to 10PM. The goal of the event is to raise funds to assist in the rehabilitation of wounded veterans and their families. The festivities will be held at the Manalapan Recreation Center. Entertainment includes three stages with live music, custom and classic car and bike shows, family and children’s’ entertainment and business, craft and food vendors. A great event for a wonderful cause! This year, there will be a special appearance f from Anna and Elsa of Disney’s Frozen from 6:00 pm to 8:00. PLUS lots of free refreshments & food, entertainment from NJ 101.5 FM, monster truck display, helicopter landing, inflatable rides, face painting, raffles, balloon art, and LOTS MORE!!! The event will be held in the Target Department parking lot, 55 US Highway 9 South, Manalapan. The Madison String Quartet will be performing on Sunday, June 8 at the Covered Bridge Clubhouse in Manalapan at 2:00 p.m. The fabulous group of musicians include violinists Evelyn Estava, Rebecca Harris-Lee, violist Michael Avagliano, and cellist Gerall Hieser. The Manalapan Arts Council is sponsoring this free event. Light refreshments will be served. The Teen Leadership Committee, TLC, will be holding a car wash this Saturday, May 31st, 10:00AM at the Applebee’s on Route 9 in Manalapan. Suggested donation is $5. Please stop by, get a wash and support this wonderful cause. The Manalapan TLC welcomes new members, ages 13-18. The group plans events, helps the community, and is a terrific way to meet new friends! 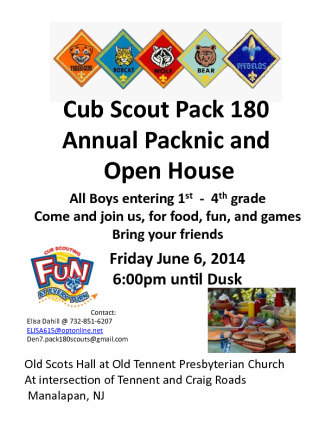 Cub Scout Pack 180 is hosting a Packnic and Open House on Friday, June 6, 2014, 6:00 PM at the Old Scot’s Hall at Old Tennent Church.